The Howland Flat Passport in Time project focused on the remains of the Gold Rush town of Howland Flat, settled in the 1850s, and located at the base of Table Mountain. By 1860, there were approximately 1,500 hundred people living in or near Howland Flat, most of whom worked in the local mines or who were the families of miners. Hydraulic mining was undertaken on a large scale in the area between the late 1850s and 1880s. Some lode and drift mining continued until the early 1900s, and prospecting continued through the Depression era (ca. 1930s). 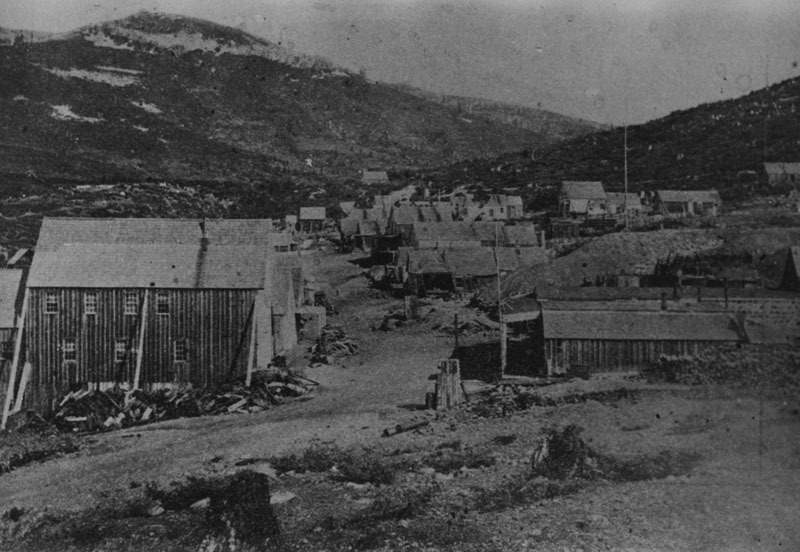 As the draw to the region's gold mines continued and the area became settled, the usual compliment of hotels, saloons, restaurants, stores, livery stables, doctors and dentists, attorneys, banks and express offices sprang up. Howland Flat even boasted a theater troupe who presented productions three nights each week during the 1860s. Howland Flat is also reported to have supported one of the largest Chinese communities in northern Sierra County. A Joss House (a temple or place for worshipping the Chinese shen - deities, ancestors, and supernatural beings), and a sizeable Chinese store operated there as recently as the early 1900s. It was this community's occupation and its resulting cultural remains that formed the center of the research design for the 2010 PIT project. Preliminary research suggested three loci within the town's limits wherein the Chinese occupations were concentrated, though survey demonstrated that virtually the entire town had at least a light scatter of Chinese artifacts on the surface. However, it was decided that excavation units would be placed in only the three areas identified as "major" in hopes that the subsurface deposits at the site would be more definitive there. These were divided into Locus A, Locus B, and Locus C.
The assemblage from Locus A appears to date from approximately 1880 to 1900, though it was here that PIT volunteers and FS staff recovered the least amount of Chinese artifacts. However, one unit at this locus had very striking stratigraphy, which appeared to represent structures that burnt down at least four times. Each burnt layer was separated by sterile soil. These are consistent with records that indicate the town burnt down several times during the nineteenth century. Even with the fewest numbers of recovered materials, several remarkable artifacts did come out of this area, and included a gold pin with crossed swords, Chinese game tokens, a glass eyedropper, and some fancy glass buttons. Locus B contained a mixture of Euro-American and Chinese goods, which were found to date to the earliest periods of the site. There was a concentration of Euro-American artifacts dating from the 1850s and 1860s, which included bottles, ceramic plates, and blacksmithing tools. Locus B contained a greater number of Chinese artifacts, however, including Chinese rice bowls, brown stoneware, and a wok tool, all surrounding the collapsed remains of a cast iron stove. Further analysis of artifacts recovered from Locus B will need to be performed to fully interpret and understand the activities within its confines, and in overall context with the site at large. Finally, materials recovered from Locus C suggest a mainly Chinese occupation, and represent the main living area for the Chinese in Howland Flat. Artifacts included several Chinese coins, an 1865 Hong Kong 1 Mill, Opium pipe fragments, a Chinese butcher knife, and rice bowl and brown stoneware fragments. 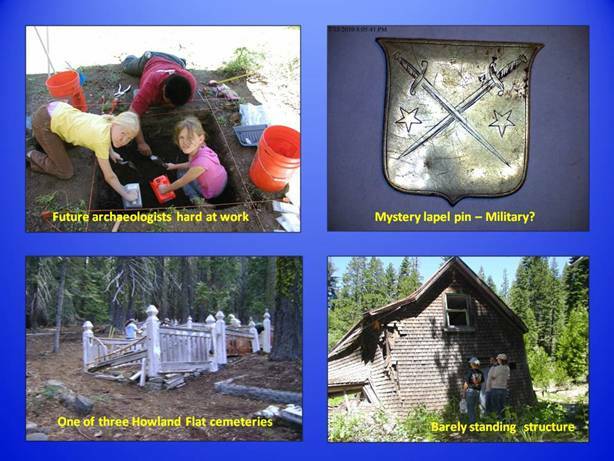 The complete success of this PIT project can be attributed to the help of 34 volunteers from around the country, and to the partnership and collaboration of efforts among the Plumas, Lassen, and Mendocino National Forest archaeologists. In total, over 70 terrific people assisted with the Howland Flat PIT excavation. Thanks to everyone who joined the project!